This is the first time The Royal Shakespeare Company (RSC) has produced this late 17th Century restoration comedy and they have picked a director making her RSC debut for the task. Selina Cadell is responsible for bringing Love For Love to life at The Swan Theatre and has chosen to keep it ultra traditional - for everything from music, costume and even the staging, with its mock theatre facade. 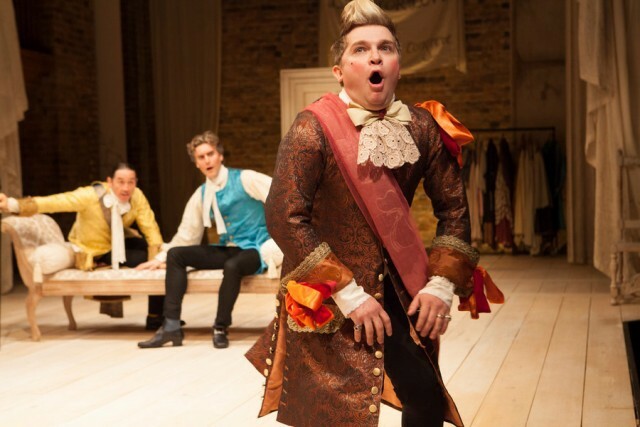 RSC comedy Love For Love at The Swan Theatre. Photo by Ellie Kurttz. Love For Love is a romantic comedy that ultimately proves that love for love is stronger than love for money. 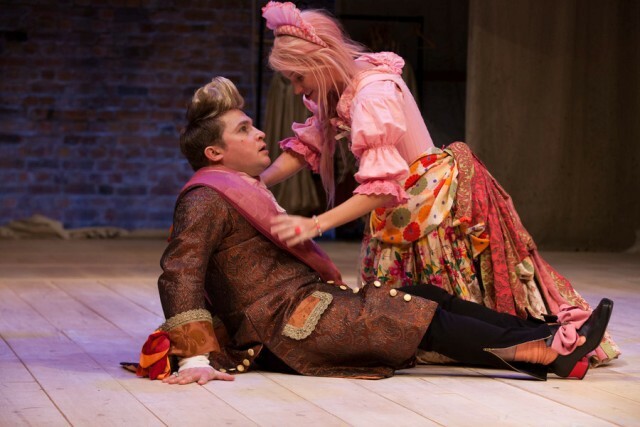 At the centre of it all is foolish but love-struck Valentine, played by one-time Hollyoaks actor Tom Turner. 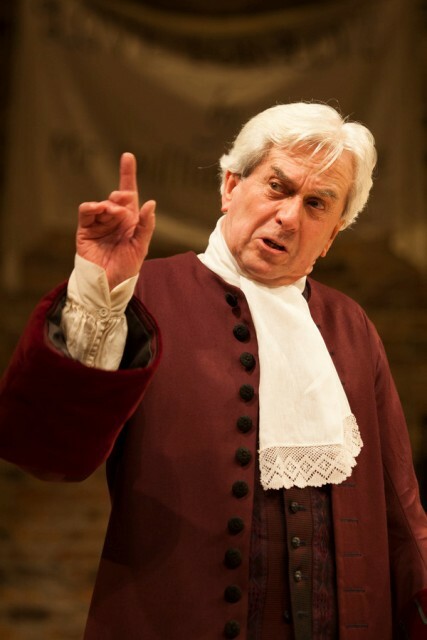 Valentine has got into debt and the wrong side of his father Sir Sampson Legend, who is trying to disinherit Valentine in favour of his brother, Ben. This sets a cat among the pigeons with the woman he loves, Angelica, and others plotting to get hold of Sir Sampson's legacy by marrying Ben, including the dastardly sisters Mrs Frail and Mrs Foresight. 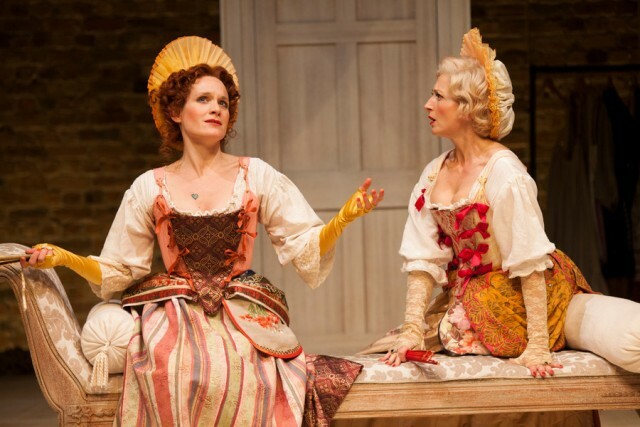 Zoe Waites and Hermione Gulliford play Mrs Frail and Mrs Foresight in Love For Love. Photo by Ellie Kurttz. As a satire, this play written by William Congreve, has aged well and still gets plenty of laughs in its lines, especially on the worthiness of peers in the Westminster chamber. But while Love For Love is enjoyable enough, it's also a frustrating production because the momentum dips far too often and lacks the raucousness or pace of similar recent RSC city comedies like A Mad World My Masters, a play that has set the benchmark in recent years. Despite this, director Cadell has made a welcome effort to recreate the ambience of theatre in the 17th Century with fun, coquettish interaction between actors and the audience, which brings some wonderful comic moments. Nicholas Le Prevost heads the cast in Love For Love. Photo by Ellie Kurttz. There's fine acting on stage too with Nicholas Le Prevost portraying a masterful, impressive Sir Sampson with gentle ease. It follow on from his role in Man & Superman at The National Theatre. 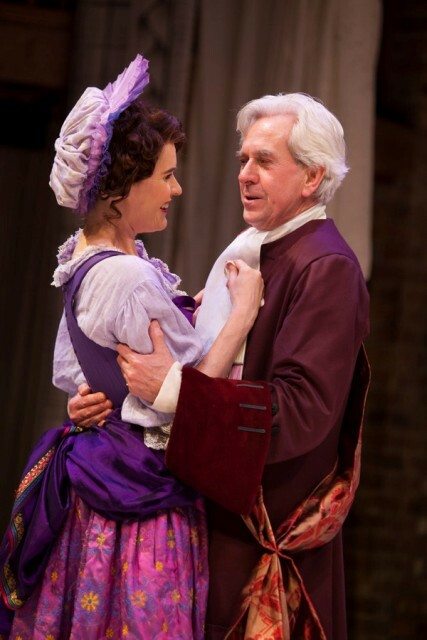 However, it is the scenes involving Valentine or Ben (Daniel Easton) that are the most enjoyable and when either of them are not on stage, the show seems to drop in tempo. The costumes, designed by Rosalind Ebbutt, are a real delight too as they are infused with an edge of modernity despite the traditional feel. Bright blues and pinks suit the sometime pantomime-esque scenes and Valentine appears like a Byron type character in flowing turquoise gown as he feigns madness. The RSC has waited a long time to put on Love For Love and although the wit still feels contemporary, this very traditional production lacks the sizzle and continous flow of action to make its mark.